Need an Antenna installed in Adelaide? Call Jim’s Antennas Adelaide team now on 131 546 (7 days 8am to 8pm) or Book Online. We specialise in digital TV antenna installation, extra TV points, extra phone points as well as all your data needs for fast Internet speeds in Adelaide. Call 131 546 for your free onsite quote, or Book a Time online with your local Adelaide Antenna specialist. 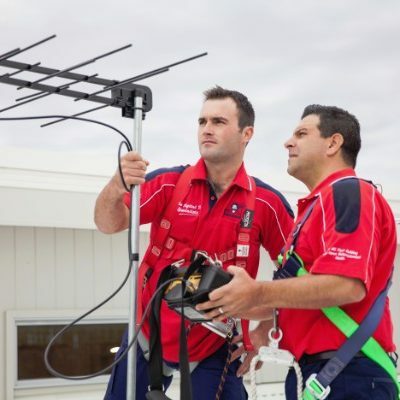 Our Expert Technicians carry with them a range of Industry Leading Antenna brands and models, to ensure we have the best possible option to suit your budget, local Adelaide terrain and signal strength. Don’t be tempted into installing a standard “all purpose” antenna without consulting on of our Antenna experts. Often an “all purpose” might provide a signal and connectivity, but can fall well short of providing optimum clarity, speed and signal strength. Jim’s Antennas Adelaide have forged a reputation in the industry that is second to none. That’s why we’ve assisted over 100,000 people in the last financial year! We generate trust in the local Adelaide community and that’s why people are happy to use and refer our Antenna Installation and Repair services. Combined with our superior products and extended warranties, and 100% Satisfaction Guarantee, we are confident this is what separates us from our competitors. Clients know that we’ll stand the test of time, and honour our satisfaction and warranty guarantees. Book 7 days (8am to 8pm) by calling 131 546 for your free No Obligation quote for TV Antenna Repair & Installation in Adelaide, or Book a Time online. There are 15 franchisees servicing the suburb of Adelaide. Great service. And accomodating with my circumstance. Was very happ|y with his efficiency and expertise ?? Jim’s Antennas Mackay – Our Version Of I’ve Been Everywhere Man!